It was a rough winter. Lots of snow, which meant lots of salt and Me, only wearing my snow boots when completely necessary, gave all my leather boots quite a beating. 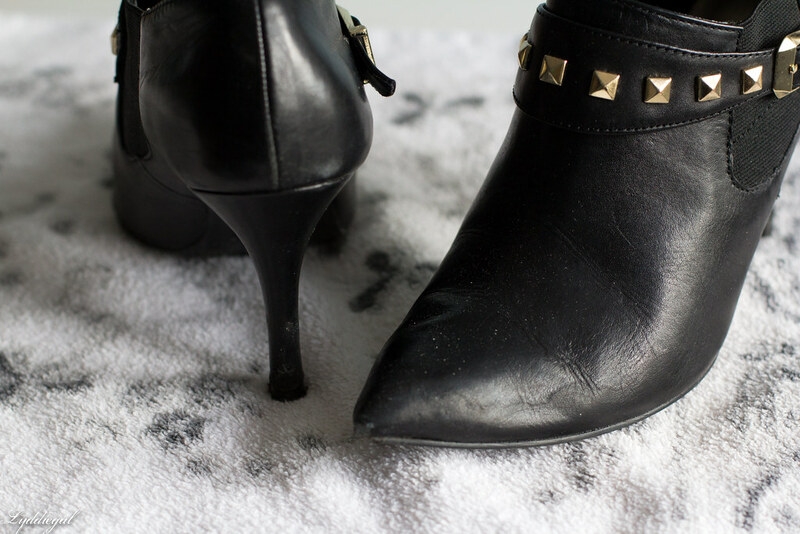 Scratches, scuffs, and the salt - I have learned the hard way, you must clean the salt off your leather boots as soon as you get home because it eats away the leather, leaving wavy lines and ridges. 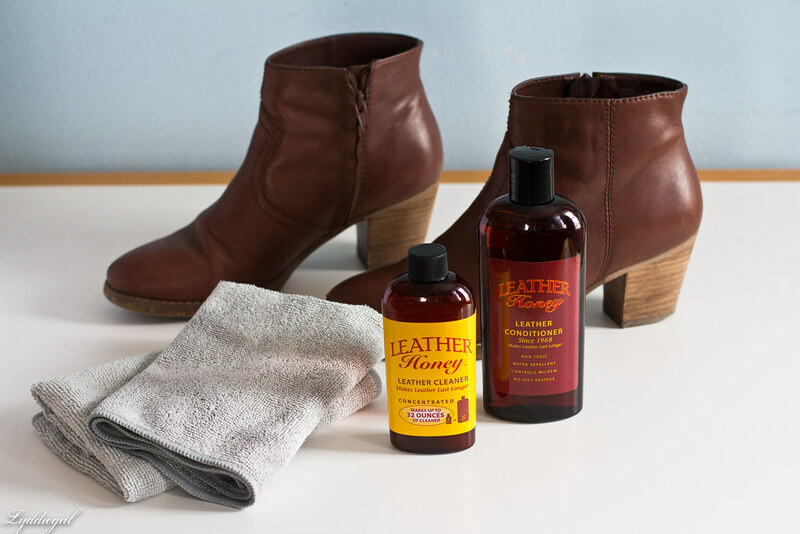 Leather Honey is a chemical free leather conditioner designed to soak into the leather's pores and give back moisture and flexibility. It also creates a water repellent barrier, and helps resist mildew. A family owned company, Leather Honey has been made in the USA for over 45 years. In addition to the conditioner, they also sell a leather cleaner, and both products can be used on all types of leather except suede. When I was contacted by Leather Honey, I was eager for a chance to try out their product. My boots were in desperate need of some TLC after this winter. I mixed up half a cup of the leather cleaner concentrate, and this was more than enough to tackle my three pairs of boots. They were already looking better. The labeling suggests that you should test the product on a small area first, I didn't bother with the boots, but I did have an experiment in mind; could the leather cleaner get the pen marks off my red Coach bag? I tested a small area under the flap of the bag, and rubbed the ink mark. It would not budge, and the leather did lighten up a bit on the area I rubbed. I was not expecting a miracle and I was okay with the ink marks when I bought the bag, but I will say if you plan to use Leather Honey on colored leather DO test on a discrete area first! After letting my boots dry for a couple of hours I returned to apply the conditioner. Leather Honey has a smell I would describe as soapy, and as the name implies, has the consistency of honey. I put a little bit on a microfiber cloth and started rubbing it into the leather. 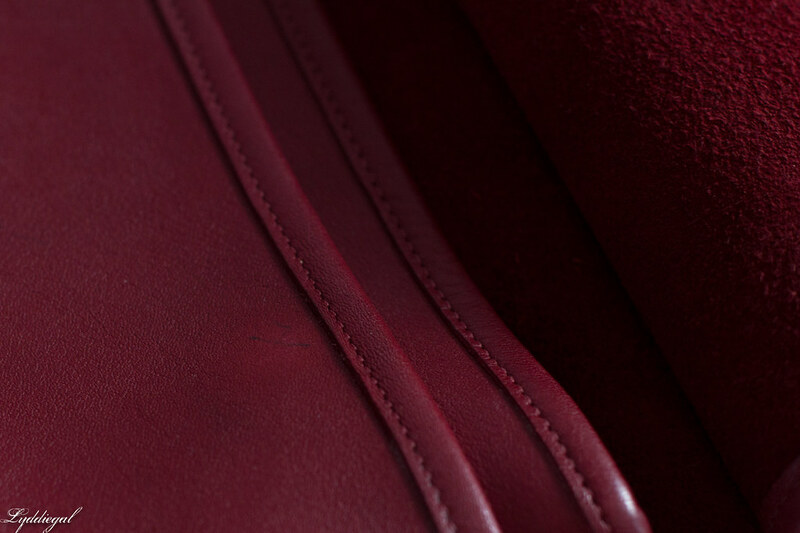 During the application it appeared very shiny on the leather, but after letting it sit overnight the appearance became more matte. Not to my surprise, my highest quality leather boots ended up looking the best after their conditioning, but all three pairs have had luster restored and are looking ready to go for another winter. I tested out the water repellency and the water beaded up and rolled off. The salt damaged leather is less noticeable, and all my boots are nice and soft. Leather Honey was easy to apply, non-toxic, and made my boots look great. I would definitely recommend this product, and will probably go through my closet and clean all of my leather with it. Leather Honey provided me with the leather cleaner and conditioner for the purpose of this review. My views and opinions are my own. This sounds like a great product. All of my leather items could use a little tlc too. 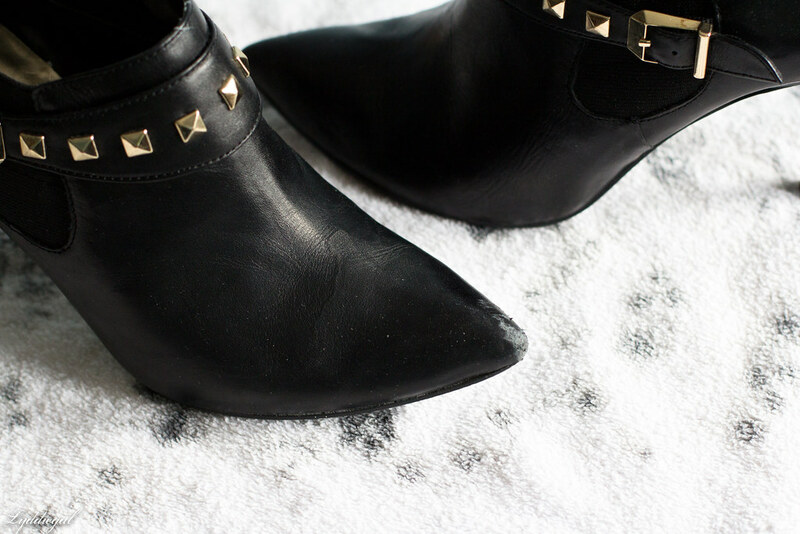 I love your leather ankle boots with the studs across the top. How awesome! They look great! I need this cleaner for my boots! My boots have been pretty much destroyed due to the harsh weather this winter. I need this! I have a pair of leather boots that are looking really beat up after wearing them so much this winter. I'm actually quite excited about this, because the snow and salt beat up my leather riding boots this winter too! It looks like it really did work so well. Great review! I never use products like this but I am now going to give this one a go! Wow! That is a big difference! I have a few pairs that need a little TLC about now. Thanks for sharing! Sounds awesome! That's the key to keeping leather nice. 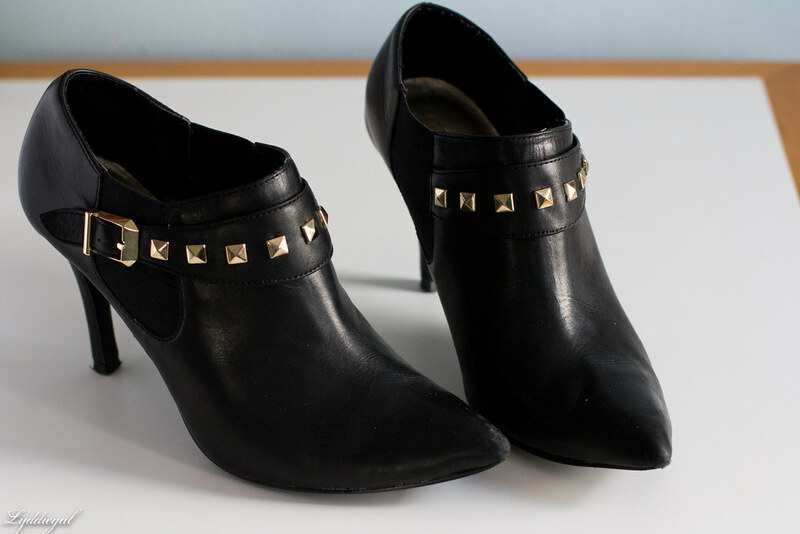 I can't believe how much Leather Honey made your studded booties look like new - especially considering the scuff mark on the toe, which is hardly noticeable after the fact! I'm lucky, living in Vancouver. Salt stains aren't really an issue and I can wear most antyhing but suede in winter. But it never hurts to take care of your good footwear and you have me thinking I have a few pairs of boots that could use polishing! I've always searched for a good leather conditioner! thanks for this post! wow, I love the resulted after used. awesome review, I really mean it. Have a great weekend! It was a rough winter for you guys! I love my leather shoes and I don't think twice about wearing them all the time here in CA because of the lack of weather. But I was just thinking that when I move back to the East Coast my shoes are going to suffer! I'll definitely be needing some leather conditioner. Thanks for sharing! Thanks for your honest review. This sounds like a great product. 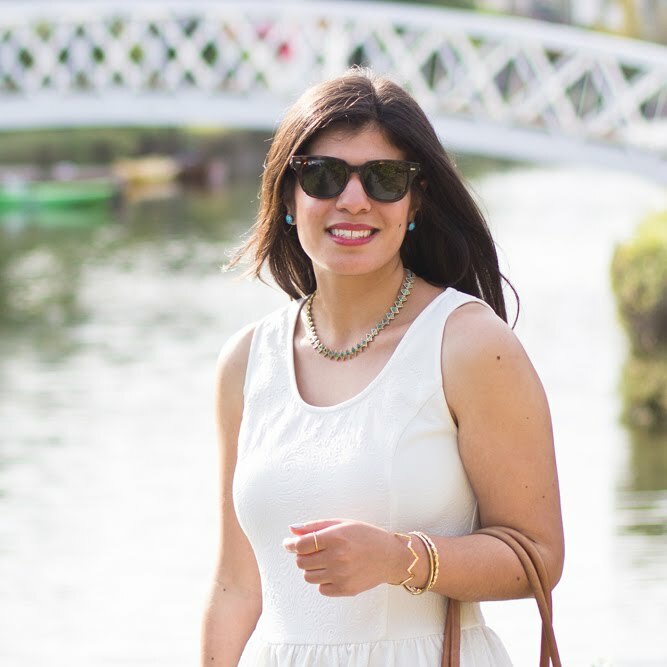 I am now all caught up with your lovely blog. As always awesome style. I am glad you enjoyed Easter too. I welcome you to stop by anytime. I always appreciate your feedback. Sweet! I def need to try a product like this out, I've got some shoes and bags that need some TLC! 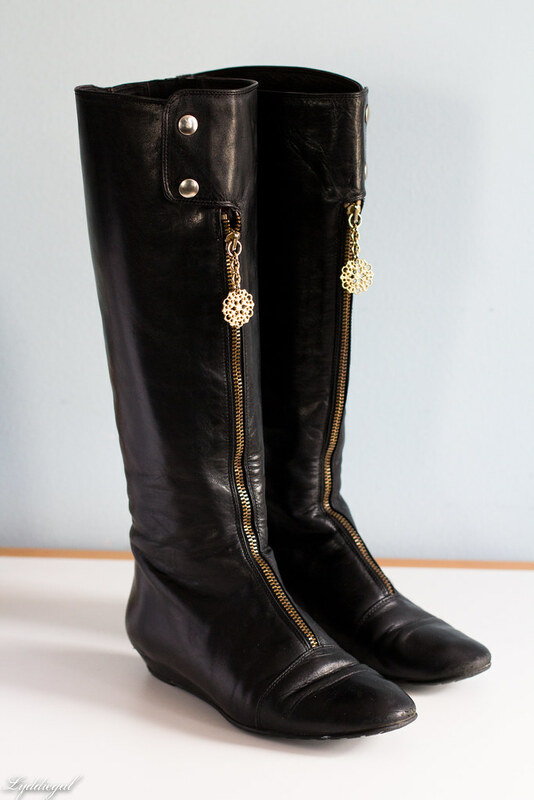 My boots totally need this after a crazy winter! i need to try this out! I have some leather shoes that need some loving! I will need to get this next fall when for all my boots!